Clean up your FCPX projects before archiving. Is there a better alternative to X-Wiper? Is X-Wiper really the best app in Video category? Will X-Wiper work good on macOS 10.13.4? 64-bit version, and a small fix for displaying the name of the chosen item. X-Wiper needs a review. Be the first to review this app and get the discussion started! X-Wiper needs a rating. Be the first to rate this app and get the discussion started! 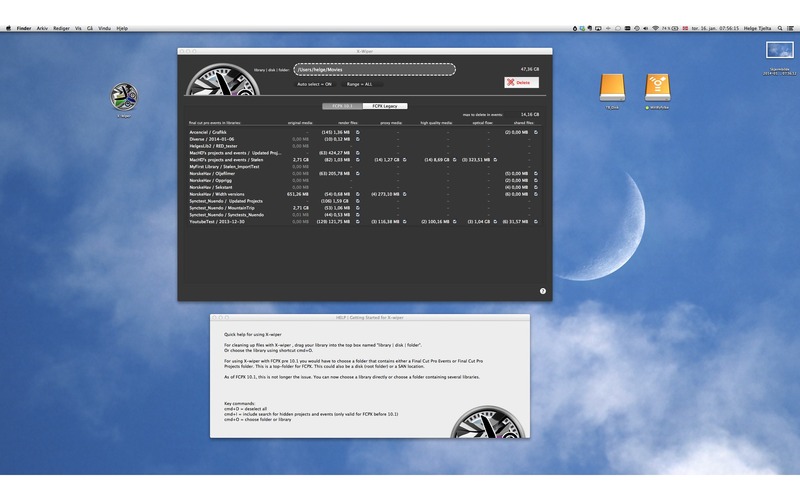 X-Wiper will help you to clean up FCPX projects and events. It is an easy way of deleting files not needed prior to archiving. You can choose to delete: render files, proxy files, high quality media files, and Optical Flow files, all of which can be generated later if needed. Only folders of more then 100MB will be checked for deletion by default. You just don't want too archive to much data. This app will help you clean up your disk, sparseimage, movie folder, or SAN location. Just drop your disk, sparseimage, /home/movie folder, or SAN location onto X-Wiper and you'll see how much is not needed for archiving. And it's not just for archiving: it is a really good program for cleaning up your projects/events in the middle of your editing as well. As an example, a film shot with a Panasonic AG-f100 camera makes an AVCHD folder of 8.7 GB. On importing to FCPX you get an additional 8.7 GB just on the import. This is your extracted original recording. But we are still in the land of H.264 codecs. You want to use a more power-friendly codec, and you transcode to ProRes for editing/online. Now you have a transcoded folder of 60 GB! Add to this your renders for both events and projects. Now, if you duplicate you project and have, say version 1, version 2, etc., then you quickly get some GB's per project, depending on how long the movie will be… let's say only 2 versions and 5 GB each.. So, you started with 8,7 GB and ends up with over 80 GB when the project is finished. How then do you get back to what you really need for you archive ? Instead of manually choosing all projects and events, and removing the render files, just use X-wiper and drop your main-folder onto it. Now you can delete all render files and transcoded files--and more--in one go.